This 1.8mm 1×19 stainless steel wire rope is part of our wider stainless steel wire rope range, this specific example combines the popular 1×19 strand configuration along with a 1.8mm width to deliver modest strength, excellent corrosion resistance and impressive overall versatility in a cost-effective package. 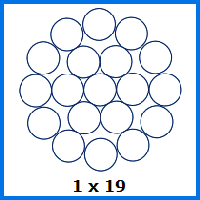 Looking for thicker 1×19 rope? We offer diameters of up to 26mm. Stainless steel is regularly selected for applications in which the wire rope will be used outdoors for most of its life, since is better able to survive the assault of the elements over time. From balconies and barriers to maritime rigging which avoids risks, you will find this 1.8mm 1×9 construction rope in a huge number of environments thanks to its in-built durability. As well as being able to pick the material, diameter and length of the rope you order from our site, you can also choose from a range of fittings to add to your order. This includes everything from swaged terminals to eye nuts and beyond. Thanks to this level of customisation and control, it is no surprise that so many clients come back to us time and time again for subsequent orders of wire rope. You can give our sales staff a call on 01384 78004 or use our contact form to let us know what you need. Whether you just want to ask us a question about our products, or arrange an order, we will be able to assist in a friendly, fast way. 1.8mm 1x19 Stainless Steel Wire Rope Overall rating: 5 out of 5 based on 6 reviews.